way Section 8 of EN 1998-1. However, it does not elaborate on all clauses in that section; and neither does it strictly follow the sequence of clauses. It is important to stress that for the overall design of a timber building, the rules of EN 1998-1 are additional to those presented in EN 1995-1-1.
up to failure is approximately linear elastic with sudden collapse, mostly associated with defects inherent to its natural origin. As for other structural materials, EN 1998-1 distinguishes between dissipative structural behaviour and low-dissipative structural behaviour for timber structures. Dissipative structural behaviour is characterized by the existence in the structure of parts (dissipative zones) which are able to resist the earthquake action in its inelastic range, and thus are able to dissipate hysteretically the energy that the earthquake inputs into the structure. In contrast, low-dissipative structural behaviour is characterized by a response of the structure to the seismic action in its elastic range, i.e. without significant yielding of its members or hysteretic dissipation of energy. Taking into account the limited ability of wood to behave non-linearly as discussed before, in timber structures the dissipation of energy should take place mostly in the connections, with the timber elements themselves behaving in the elastic range, in which the response is very good. The brittle failure of timber elements results from natural defects in the material, for instance knots. Only for compression perpendicular to the grain may some non-linear response be expected, with some capability for energy dissipation. In total contrast, tension perpendicular to grain exhibits a markedly brittle failure associated with splitting of the material. Accordingly, what establishes the main difference between dissipative and low-dissipative timber structures is the nature of their connections. Hence, EN 1998-1 presents a basic distinction between semi-rigid joints and rigid joints, the former being associated with the possibility of being provided with the capability of dissipating energy under reversed cycling, whereas the latter (essentially glued solid timber joints) are devoid of such capability. • crushing of the wood fibres bearing against the dowel. The first mechanism tends to be stable, and provides large hysteretic loops (typical of reversed yielding of steel in bending), whereas the second mechanism is characterized by thin hysteretic loops, which are markedly pinched and present significant strength degradation for cycling at constant amplitude. This is caused by the progressive increase in size of the cavity that is being formed in front of the dowel by the wood crushing, as the succession of cycles progresses. Naturally, the response of the connection as a whole results from the interaction between the two mechanisms, and so to achieve good dissipative behaviour it is crucial to achieve a correct balance between the wood crushing and the dowel yielding, for which the more significant parameter is the slenderness of the dowel-type element (i.e. the ratio between the thickness of the connected member and the fastener diameter). Besides the main distinction between dissipative and low-dissipative structures, EN 1998-1 subdivides dissipative structures into two ductility classes, namely Ductility Class Medium (DCM) and Ductility Class High (DCH), with Ductility Class Low (DCL) being assigned to low-dissipative structures. The use of the concept of ductility classes is established in general terms in Section 2 of EN 1998-1 (see clause 2.2.2(2)); the subdivision of classes indicated for timber structures is in line with those established for other structural materials (reinforced concrete, steel and composite). The choice between ductility classes in timber structures is left to the designer, as is the case for other materials. However, in this case it is foreseen that national authorities in the relevant National Annex may establish some limitations in the use of the various ductility classes (i.e. the applicability of the different ductility classes to timber structures is a Nationally Determined Parameter). In any case, as noted in Section 2..2.2, the choice between different ductility classes corresponds roughly to the trading between higher lateral resistance on the one hand and higher deformation capability in the non-linear range (ductility) and energy dissipation capacity on the other hand. For timber structures the parameters that influence its ductility classification are the structural type (essentially reflecting the greater or lesser redundancy of the structure as a whole) and the nature of the structural connections (essentially reflecting its ductility and energy dissipation capacity). For the latter, EN 1998-1 states in general that the properties of the dissipative zones (i.e. the connections) should be determined by tests, in accordance with prEN 12512.85 However, for the most common connection types, some deemed to satisfy rules are presented in the code, in order to reduce the burden of testing connections in ordinary design situations. As a final remark and in line with other structural materials, it should be noted that for timber structures of DCL, the behaviour factor may be taken up to q = 1.5. Even though, as indicated above, for this ductility class no significant decrease of the earthquake forces is expected on account of a non-linear response; the use of a behaviour factor slightly greater than q - 1 is justified by the overstrength that structures normally present under earthquake action. timber structures) also apply in the design of earthquake-resistant timber structures covered by EN 1998-1. The same is true for the steel elements included in joints and connections, concerning the requirements set forth in EN 1993-1-183 (Eurocode 3 for steel structures). and DCH, some additional requirements have to be fulfilled with regard to the mechanical characteristics of the materials and to the characteristics of joints. In all cases, the objective of the additional requirements is to avoid brittle failures and to obtain connections with stable behaviour under large deformation reversals. • for particle-board and fibre-board sheathing the thickness should be at least 13 mm 0 for plywood sheathing the thickness should be at least 9 mm. This is intended to ensure the excellent ductile behaviour shown by nailed shear panel systems, which is usually superior to conventional diagonal bracing but relies very much on the properties of the sheathing boards.86 Also important for the appropriate (i.e. stable) response of this sort of system is the avoidance of the pull-out of the nails under transverse cycling. To this end, a point side penetration of 6-8 times the sheathing thickness is appropriate, and smooth nails should be avoided or be provided with additional provision against withdrawal (e.g. by coating or clenching). in turn, controls the lateral forces for which the structure has to be designed (as discussed in general terms in Chapters 2 and 4, independently of the structural material). 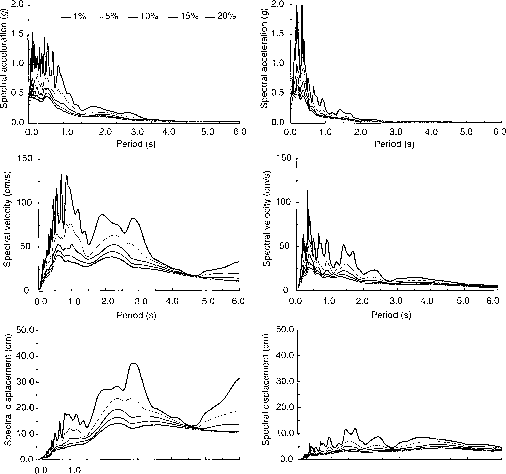 For timber structures, EN 1998-1 presents upper limit values of the behaviour factor depending on the ductility class and the type of structure and connections used. Besides the general upper limit of q = 1.5 for DCL accounting for overstrength, for DCM and DCH the values indicated for q in Table 8.1 of EN 1998-1 are reproduced in Table 8.2 with a different arrangement that highlights the influence of the various parameters on the ductility of timber structures (namely the superior behaviour of correctly designed and executed nailed connections). The values presented in Table 8.2 are appropriate for buildings, which are regular in elevation (see Chapter 4). For buildings with non-regular structure in elevation, the behaviour factor should be reduced by 20%, as is also required for buildings of other structural materials, in order to account for the expected higher local ductility demands in those cases. The values presented in Table 8.2 are applicable if the dissipative zones in the structure are able to withstand, without a decrease of strength of more than 20%, three fully reversed cycles at a ductility demand of /i = 4 for DCM and /i = 6 for DCH. For portal frames the ductility should be evaluated in terms of the rotational capacity of the joints, whereas in wall panels the ductility should be evaluated in terms of shear displacements of the panels. In principle, the available ductility should be measured by testing. For non-bilinear responses (i.e. a response without a clear identification of the yielding point), as is normally the case for timber joints with doweled metal connectors, it is sometimes difficult to evaluate the available ductility, due to the absence of a precise value for the yielding displacement (or rotation). To overcome this difficulty, a bi-linear diagram enveloping the real constitutive diagram may be used as an equivalent response, in which case the yielding is defined precisely. It is suggested87 that for timber structures the second branch of such an equivalent bi-linear envelope has a stiffness which is one-sixth of the stiffness of the initial (linear) branch. (1) The slenderness of the fasteners in doweled, bolted and nailed connections should be greater than 10 (t/d > 10, with t being the thickness of the connected member and d the fastener diameter) and the fastener diameter should not be larger than 12 mm. (2) The sheathing material (wood based) in shear walls and floor diaphragms should have a thickness larger than four times the fastener diameter (f > Ad), and the nail diameter should not exceed 3.1 mm. These requirements reflect that, for good performance of the connections under cyclic load, thick timber and slender dowels are preferable because they allow for yielding in bending of the fasteners (whereas with stocky dowels the failure mode will mostly be associated with the crushing and splitting of the timber fibres, which does not allow for the dissipation of energy). In any case, the numerical values are relatively severe, and it has been suggested86 that an even less demanding value of t/d > 8 is still very much on the safe side in terms of the ductility of connections. Also it is worth mentioning in this context that EN 1995-1-1 (Eurocode 5 for timber structures in general) allows much larger bolts and dowels with diameters up to 30 mm (clauses 8.5.1.1 and 8.6 of EN 1995-1-1). Hence, when the above requirements are not met strictly (i.e. if t/d > 8 and t > 3d, respectively, for cases 1 and 2 above) it is still permitted to avoid testing of the connections of dissipative structures, but the maximum values of the behaviour factor should be decreased as shown in parentheses in Table 8.2.
behaviour of connections and horizontal diaphragms. For bolts, an absolute limit of 16 mm is established for their diameter, unless toothed ring connectors are also used These provide some confinement of the wood in front of the bolt and allow for the larger bearing forces associated with larger bolts. Furthermore, it is required that in pre-drilled connections they are tightly fitted. This is because oversized holes may cause a non-uniform distribution of loads in different bolts of the same connection. In such cases there may be a tendency to overload some bolts, which triggers premature splitting and crushing of the wood bearing against these bolts, initiating a chain collapse in the other bolts. For floor diaphragms, the additional detailing provisions are intended to increase the effectiveness of the sheathing material and the stability of its connection (particularly at the edges of the panels) to the framing timber elements. This is reflected by forbidding consideration of the increased resistance of edge fasteners (allowed for in general terms for 'non-seismic/non-ductile' cases by clause 9.2.3.1 of EN 1995-1-1) and by more strictly controlling (i.e. limiting) the nail spacing at the panel edges allowed by clause 9.2.3.2 of EN 1995-1-1. Also closer spacing has to be adopted for fasteners in areas of discontinuity in case of relatively high seismicity (agS > 0.2g) to avoid the premature initiation of rupture in those areas and to somehow compensate for its decreased stiffness. In any case, the minimum spacing established in EN 1995-1-1 (clause 10.8.1) should always be respected to ensure that splitting of the wood is prevented. Accordingly, in these areas of discontinuity, the dimensions of the timber elements should be generous to allow effective nailing that is not too closely spaced. 5 and 6 of EN 1995-1-1. Naturally, in the seismic design situation, the strength modification factor kmod, which accounts for the influence of the duration of the load (and also of the moisture content) on the resistance of timber or wood-based materials should be taken with the value appropriate for instantaneous actions (see Table 3.1 of EN 1995-1-1). • structures of DCM or DCH, for which it is permitted to use the smaller (equal to 1.0) values recommended for the accidental load combinations (see Table 2.3 of EN 1995-1-1). This is an important departure from analogous recommendations in other sections of EN 1998-1 for other structural materials (namely Section 5 for reinforced concrete, Section 6 for steel and Section 7 for composites), in which it is recommended that 7M values for the fundamental load combinations are used in the seismic design situation. This rule has an important influence on the outcome of the design for the two types of structure (low dissipative and dissipative), and reflects the more reliable response of timber connections and timber structures satisfying the additional requirements for dissipative structures which are set forth in this section of EN 1998-1.